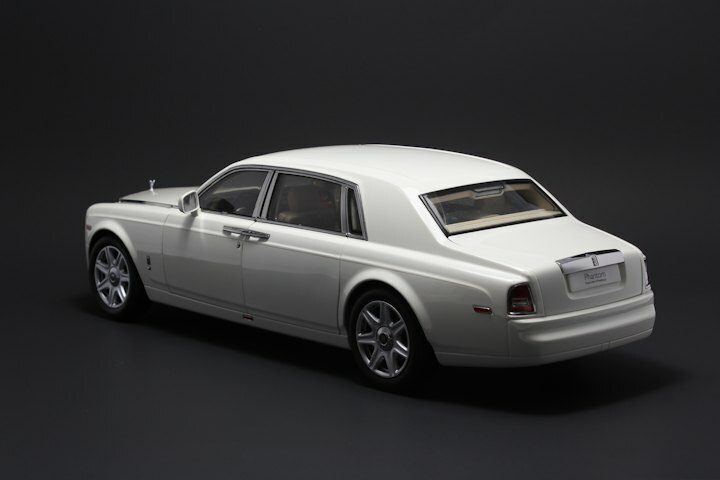 After a really long wait Kyosho released their most anticipated model of the year, the Rolls Royce Phantom Extend Wheel Base (EWB). 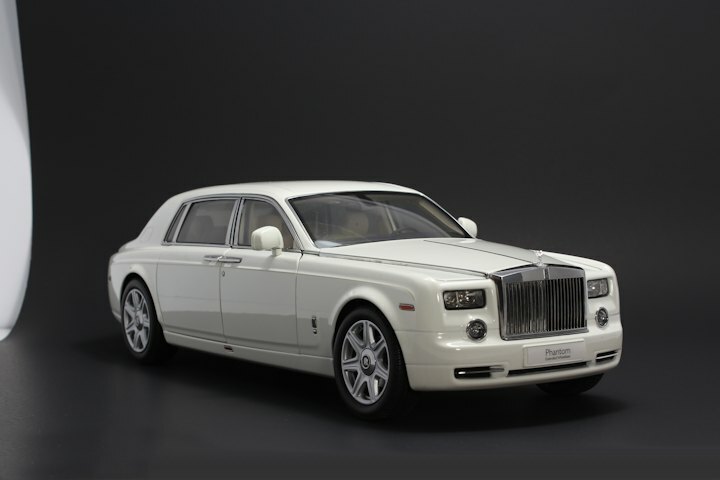 This model happens to be the second of two estate luxury offering, the first being the hugely successful Kyosho 1:18 Rolls Royce Ghost. 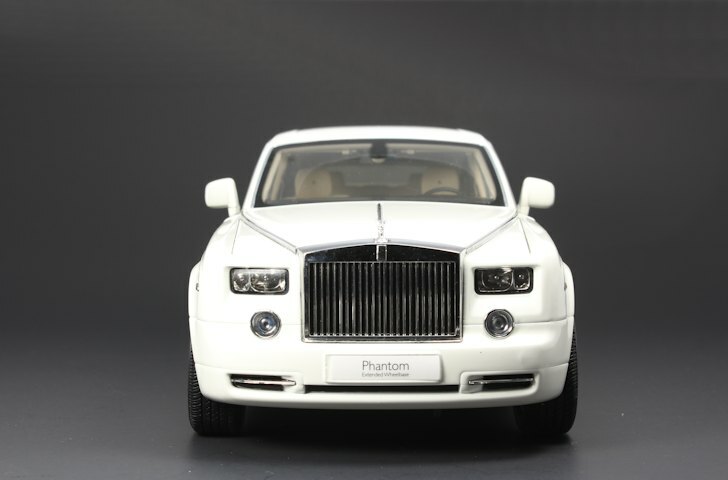 Kyosho released the Phantom in white and black with silver and grey on its way, along with the much desired Drophead Models. 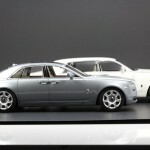 This is the second longest model in my collection after the Maybach 62. 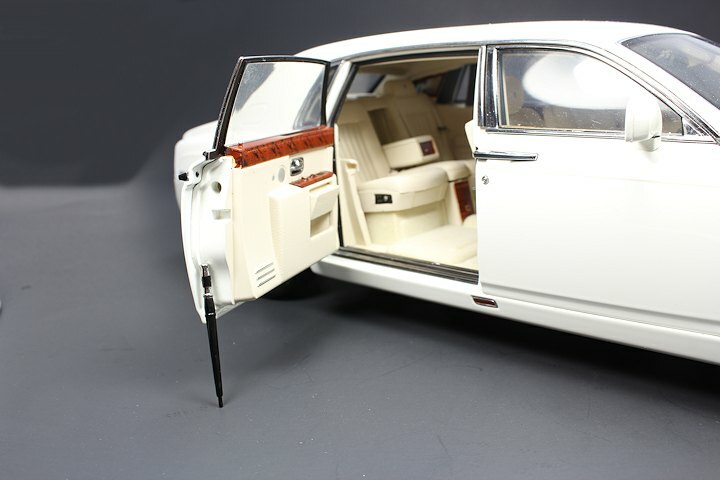 It took me by surprise when I found out that Kyosho decided to go with the coach line Extended Wheel Base (EWB) version on this model. 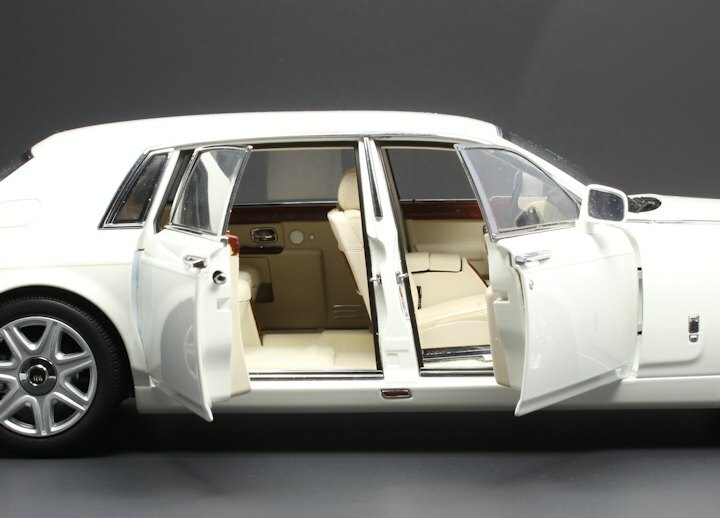 The exterior is quite charming, a true classic in luxury. Finish is in white with coach lines on the side running all the way from front to the end of the car. Very detailed craftsmanship can be found on the headlights, along with the turn indicators and where ever else the chrome is used on the car. 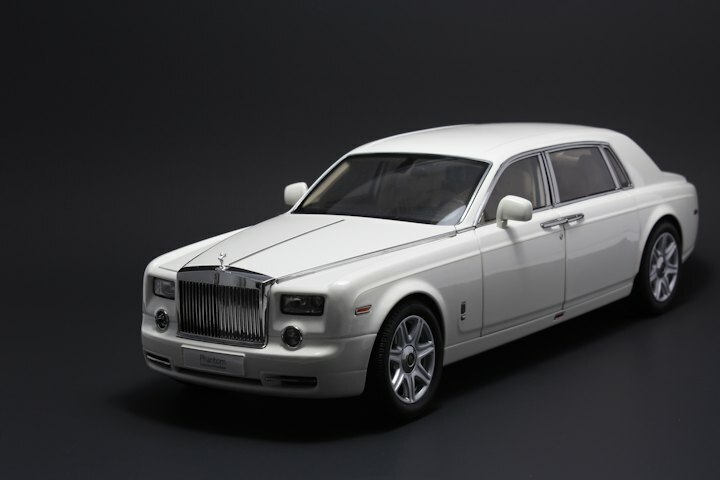 Rolls Royce Phantom comes with the retractable rear view mirror just like the Rolls Royce Ghost. 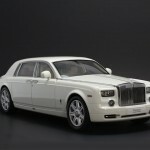 The model comes with the traditional Rolls Royce Grill and Royce hubcap covers, definite trademarks of the brand. 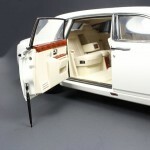 I was shocked to find out the car was launched without the sunroof which was a major disappointment. The rims are quite basic in style, whereas I prefer more chrome and flash. Just like the Chinese version, the car is heavy; this extra weight adds pressure on the front wheels, which appear to affect the front camber at times. 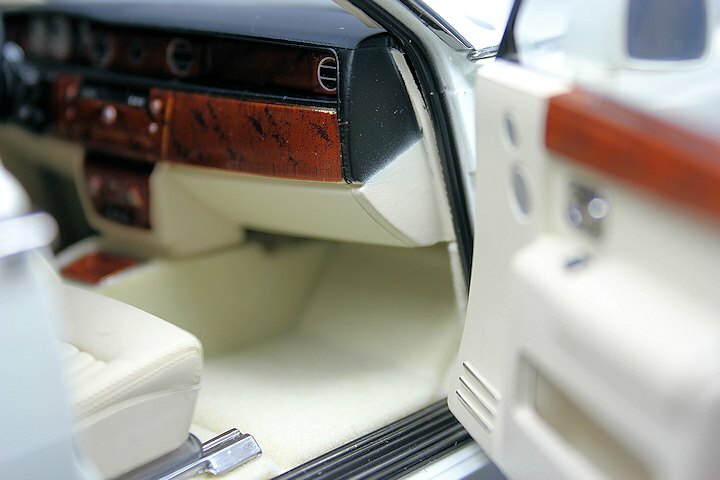 Interior is in classy plain light beige. 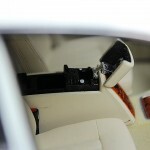 The dashboard is very well defined with great details throughout. 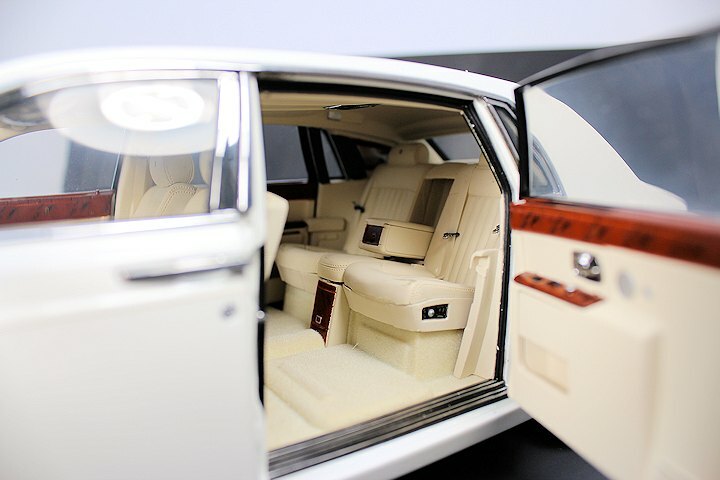 Rolls Royce Phantom features many new functional items like operational glove box, central arm rests in the front and the rear, and sliding rear and front seats have all added to the overall detail and execution. 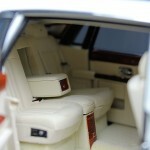 Not to miss, the model is packed with the traditional Rolls Royce umbrellas. However I feel certain details/refinements inside the car were missed. 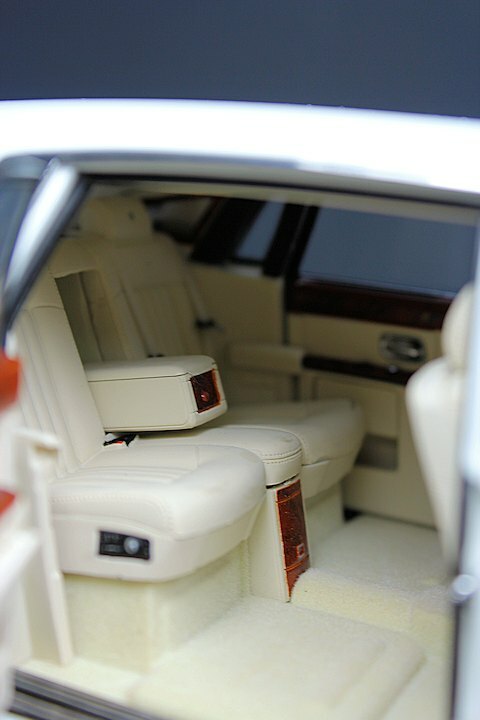 If you look closely at the interior images you’ll see exactly what I mean. A model of this calibre should be near perfect. 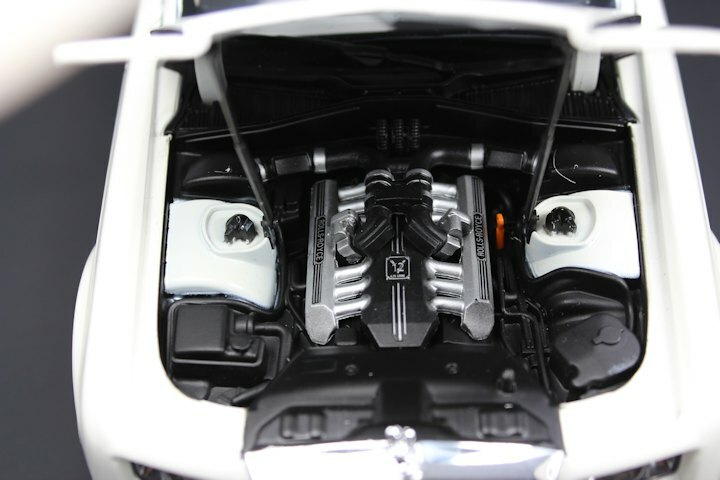 Engine detail on the whole is well defined with good finish throughout. 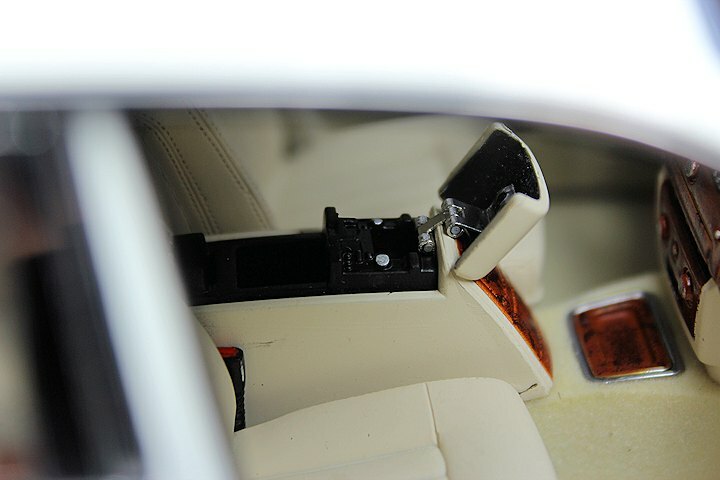 The hood features nicely detailed solid struts to open the hood and firmly keep it at rest. 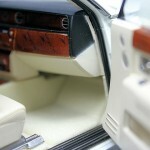 The rear trunk space is large and fully carpeted. Detail here is again on par with the rest of the model. 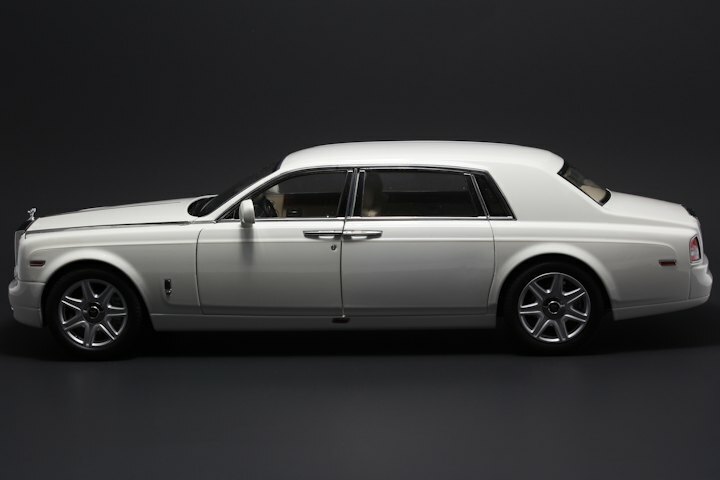 Overall these high-end luxury models don’t have mass appeal, but if you’re a collector of fine luxury, the Rolls Royce Phantom Extend Wheel Base (EWB) is a true example of luxury to the power of ten. Though there are a few setbacks with interior execution with the model and lack of support for the added weight of the extended wheel base, Kyosho still has a winner here. 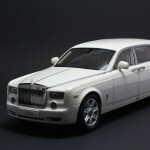 9 Responses to "REVIEW: Kyosho Rolls Royce Phantom (EWB)"
Thanks for this review. I´ve been looking forward to this model for a very long time. I´ll wait for the black one to arrive, though. It will then replace my resin model that I bought way back when not a single 1/18 Roller was in sight and there was little hope of it ever being made. Even though not as well executed as the Ghost in its interior, it will still keep its little brother better company in the display case than the old resin. 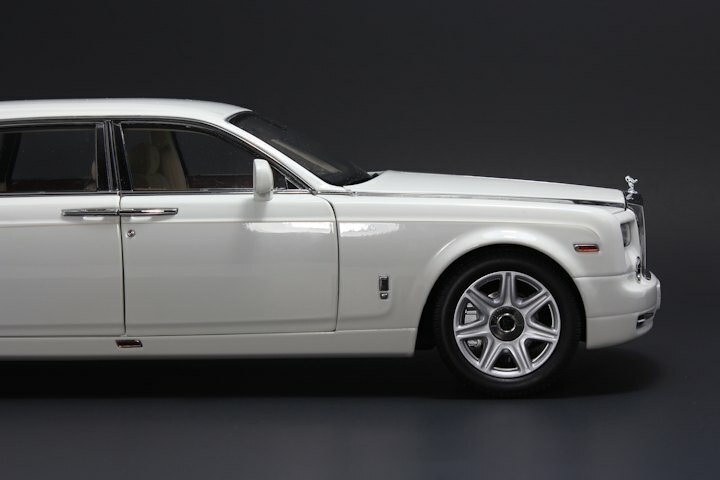 How much is this Phantom? Is it worth paying extra for the other? $260/$280CND respectively. I’m not sure, I guess if high-luxury vehicles are your thing yes. 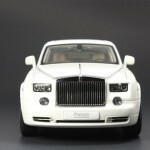 I personally am selling off the Phantom. Check the classified section if interested. Sweet deal! Hey guys great review. 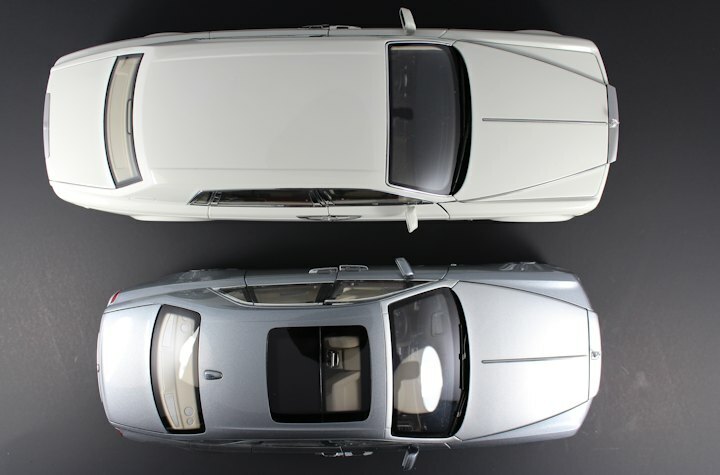 I’m thinking of getting the Phantom EWB in black with white interior or getting the Ghost, I’m not much of a luxury car collector though (I usually collect supercars), but I thought I’d give it a try for once so which one would you advise me to pick and which color depending in the model you’d choose ? In your opinion, which will you recommend? 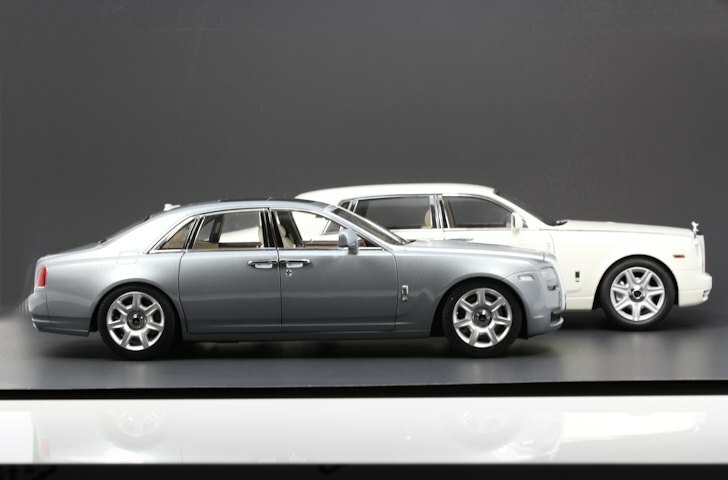 The Ghost or the Phantom. I really can’t decide. Very similar overall, my suggestion buy what YOU like best!